Cravings for Mexican food strike me regularly, but I’m selective when it comes to adding local Mexican joints to my go-to list. When Bryan from El Chile invited us to stop by and give the weekend dining experience a try, I obliged with an open mind. Soon, Cantina El Chile will open across the street from the Manor location. Cantina will serve hand-crafted drinks and appetizers, and the space will also be available for events. 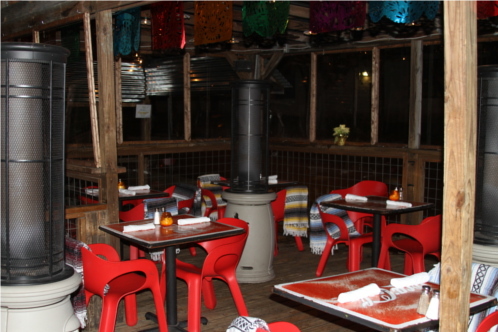 El Chile’s outdoor patio, with heaters and blankets for the cold weather! I chose to visit El Chile’s original location on Manor. I had driven by multiple times and it always looked inviting, but I had never taken the time to park the car and step in. Arriving on a cold Friday evening around 7 PM, Eric and I stayed put for a couple of hours. There was no wait for a table, though – fair warning – I’ve seen the space quite busy during warmer days and nights! 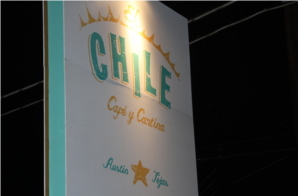 El Chile’s interior was warm and welcoming, with colorful artwork and trendy music with electronic vibes. My whole visit reminded me of the “Be Our Guest” bit in Beauty and the Beast, without the castle and talking furniture. Our table was filled with an abundance of dishes that pleased my eyes and my tummy. 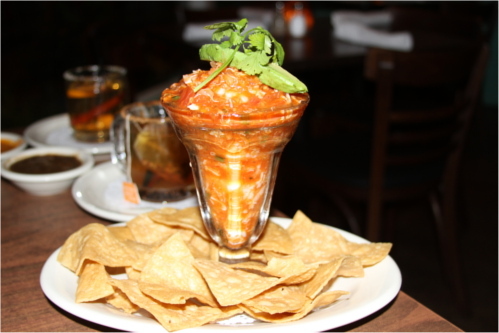 El Chile’s menu is extensive, filled with appetizers, entrees, desserts and drinks. There are also specials available on weekends (more on that later). Navigating a large menu can be overwhelming for first-timers – and it was for me! Eager for direction, I asked our server Anna what she recommended. 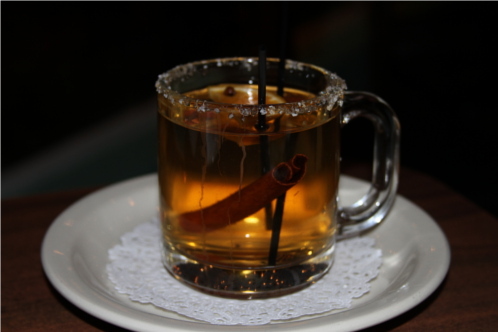 As we were getting settled, Anna started me off with samples of El Chile’s seasonal hot toddies: Apple and Tamarind. The Apple had a sugar and cinnamon rim. Sweet, simple and calming. The Tamarind had a salt and sugar rim. I really couldn’t pick a favorite between them, but I can’t think of anything more perfect for a cold winter night. El Chile has two house salsas they serve with chips when you arrive. The black-colored salsa is not made from black beans, as I originally assumed. It’s made of tomato, garlic, onions and jalapenos – all roasted together. The other unique salsa is a blend of habanero peppers, jalapenos, white onion, garlic, tomatoes, cilantro and carrots! The carrots give the salsa its unique color. The appetizers were a big highlight for me. We tried three popular choices: Nachos de Barbacoa, Guacamole Clasico and Campechana de Mariscos. 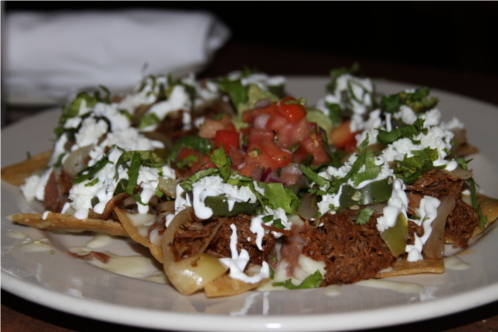 The Nachos de Barbacoa are loaded with braised short-rib barbacoa cooked in beer on bean and cheese nachos, and topped with roasted jalapenos, grilled onions, sour cream and a sprinkling of queso fresco. Served with guacamole and pico de gallo, this huge plate could be a whole meal! This wasn’t my favorite appetizer I tried, but there was nothing “wrong” with it. Considering it’s one of El Chile’s most popular choices, I’m sure it’s a matter of personal preference on my end. 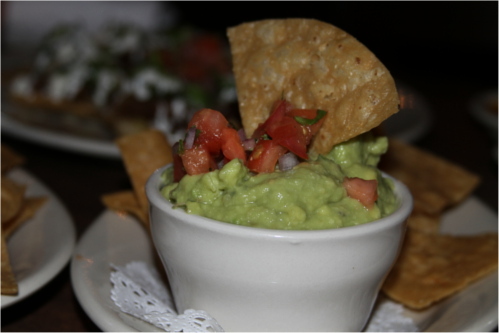 On the other hand, the Guacamole Clasico was a favorite. The balance of flavors was perfect, and it was served chilled and deliciously fresh. One thing I noticed was its consistency. It was light, almost as though it had been whipped. And then there was the Campechana de Mariscos, which I can’t say enough about. This amazing seafood cocktail has a slight bite to it, and it’s full of lumped crab and jumbo Texas Brown shrimp that has been cooked in oregano. Take note that when the menu mentions avocado, it’s just a small slice on top as a garnish. I made up for it by eating the Campechana and Guacamole Clasico together. The combination was delicious. I would make a trip to El Chile for this appetizer by itself. When it came to my entree, I had to try the weekend special: Duck Relleno. As a disclosure up front, I’m not a huge duck or relleno fan, but I wanted to give it a try! I was pleasantly surprised. The stuffed pepper was smothered in walnut cream sauce (“en nogada”) and sprinkled with pomegranate seeds. I enjoyed the taste combination of hearty duck, creamy walnut sauce, and sweet and tangy pomegranate seeds. Eric tried Downtown Charlie’s Special for his main dish. 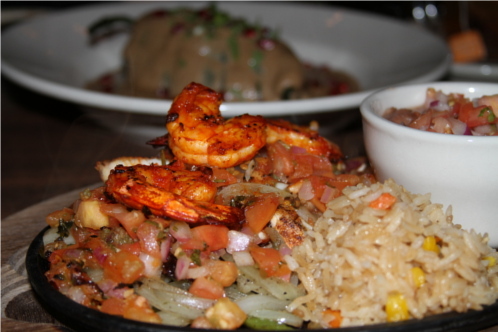 It’s a mixed-meat fajita combination plate, served with shrimp and the diner’s choice of steak or chicken. However, our server told us that anyone can order all three meats together, with no up-charge. Eric ordered all three, and favored the shrimp and the steak. I’m a fan of chicken in general, so I would choose that over the steak! Downtown Charlie’s Special was served with enough shrimp for one taco. Between the chicken and beef, we could make another four tacos. The tortillas were high quality. On the side, I tried the charros beans, black beans, Mexican rice, and white rice mixed with corn and other small vegetable pieces. Anna also gave me a sample of El Chile’s Enchiladas Verdes, one of my go-to Mexican dishes. I had no complaints about the dish and would definitely give it a try on another visit. Besides the appetizers, El Chile’s desserts were the other highlight of our meal. We tried the Tres Leches, Pastel de Chocolate, and homemade Mexican Vanilla and Raspberry Chipotle Chocolate Chip ice cream. What a spread! The Pastel de Chocolate was the standout for me. So delicious and creamy that I wished I had room for another slice. 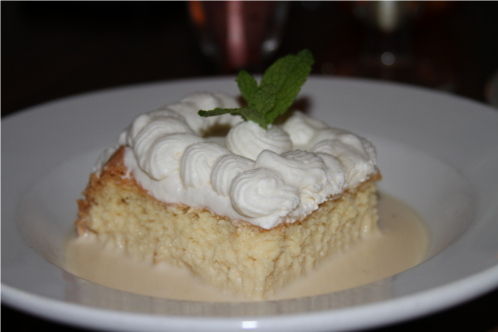 For fans of Tres Leches, it was airy and fresh. El Chile lists multiple flavors of homemade ice cream on their menu, but we were disappointed they were out of everything but the Mexican Vanilla and Raspberry Chipotle Chocolate Chip flavors. The Raspberry had a unique and spicy taste, but it wasn’t our favorite. 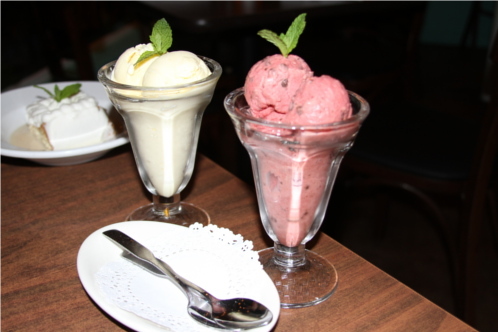 We enjoyed the flavorful and creamy Mexican Vanilla, but wished we could’ve tried Cajete and Abuelita’s Chocolate. I guess we’ll have to go back soon to try these two other flavors! Understated hip ambiance that strikes you as soon as you walk in. No pretense, just smiling faces and a laidback atmosphere that puts you at ease. El Chile’s menu includes traditional Mexican dishes you might expect to find. For those who don’t appreciate weird variations when their taste buds are set on a particular dish, I really appreciate this. However, El Chile takes tradition and makes it better with noticeably fresher ingredients than I typically find in other Mexican restaurants around town. Though the go-to dishes are there, El Chile mixes it up with weekend specials like the Duck Relleno, and amazing appetizers and desserts. Here’s the bottom line for me: El Chile’s entrees aren’t remarkably different from others. Though I’m not sure I would drive across town to go to dinner, I have found myself craving their appetizers and desserts ever since my visit. I think El Chile is perfectly suited for a post-work hangout, drinks and desserts, or any casual stop on your way to somewhere. Sure, you can make it an all-night affair and I doubt you’ll be disappointed. But I value having a place where I can meet a friend for a hello and an appetizer, or a first-time meeting with a guest blogger. Most restaurants aren’t worth visiting for their appetizers or desserts alone, and so you have to make it a dinner affair. El Chile isn’t like that. 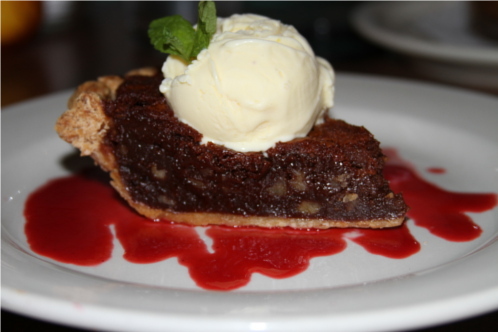 Their main courses are solid, but their appetizers and desserts are absolutely impressive. Because of the strength of the menu as a whole, the venue’s suitability for various times of day and all kinds of occasions is expanded. But don’t take my word for it. I’d really appreciate your feedback in our comments section. Let me know what you think of El Chile and what your favorite dish or drink is. I’m already planning my next visit and will take your recommendations into consideration! 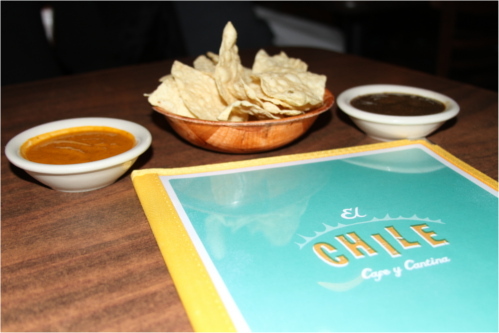 If you’ve been to El Chile, what did you think? If you haven’t been yet, do you have any questions for me? Disclosure: El Chile covered the cost of our meal for the purposes of this review. All opinions are my own.